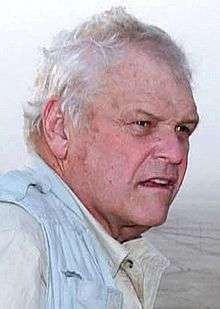 Brian Manion Dennehy (born July 9, 1938) is an American actor of film, stage, and television. A winner of one Golden Globe, two Tony Awards and a recipient of six Primetime Emmy Award nominations, he gained initial recognition for his role as the antagonistic Sheriff Will Teasle in First Blood (1982). He has had numerous roles in films such as Gorky Park, Silverado, Cocoon, F/X, Romeo + Juliet, and Knight of Cups. Dennehy was born in Bridgeport, Connecticut, the son of Hannah (Manion) and Edward Dennehy, a wire service editor for the Associated Press. He has two brothers, Michael and Edward. He is of Irish ancestry and was raised Roman Catholic. The family relocated to Long Island, New York, where Dennehy attended Chaminade High School in the town of Mineola. Dennehy enlisted in the U.S. Marine Corps in 1959, serving active duty on Okinawa until 1963. In numerous interviews, Dennehy has claimed to be a Vietnam veteran who served a 5-year tour in Vietnam and recounted harrowing tales of his combat there, but according to the book Stolen Valor, Dennehy never served in Vietnam at all and never saw active combat. The author of Stolen Valor wrote to Dennehy regarding the discrepancy, but received no reply from the actor, although Dennehy later admitted in an interview that he had lied about his service and apologized for it. After his Marine Corps service, Dennehy went on to attend Columbia, where he played football and majored in history, where he also became a member of the Sigma Chi fraternity, before moving on to Yale to study dramatic arts. He played rugby union for Old Blue RFC. Prior to his pursuit of an acting career, Dennehy worked as a stockbroker for Merrill Lynch in their main office in downtown New York in the mid 1970s. Dennehy had a voice role in the animated movie Ratatouille as Django, the rat chef Remy's father. He appeared as the superior officer of Robert De Niro and Al Pacino in the 2008 cop drama Righteous Kill and as the father of Russell Crowe in the 2010 suspense film The Next Three Days. Dennehy portrayed Sergeant Ned T. "Frozen Chosen" Coleman in the television movie A Rumor of War (1980) opposite Brad Davis. He continued to appear in such high-profile television movies as Skokie (1981), Split Image (1982), Day One, (1989), A Killing in a Small Town (1990) opposite Barbara Hershey, In Broad Daylight (1991), Scott Turow's The Burden of Proof and the miniseries A Season in Purgatory. He also played the title role in HBO's Teamster Boss: The Jackie Presser Story. In December 2010, he returned to Ireland to play the Bull McCabe in the Olympia Theatre of Dublin's stage version of John B. Keane's The Field. In April through June 2012, he played the role of Larry Slade in the Eugene O'Neill play The Iceman Cometh at the Goodman Theatre in Chicago, which he reprised in 2015 when the production, with most of the Goodman Theater production cast, was revived at the BAM Harvey Theater in New York City. He is the father of the actress Elizabeth Dennehy. 2016 The Blacklist Dom Episode: "The Artax Network"
↑ "Person Details for Brian Manion Dennehy, "United States Public Records, 1970-2009" — FamilySearch.org". ↑ Dennehy, Michael. "Grateful that my parents came to America". NorthJersey.com. ↑ "Brian Dennehy Biography". filmreference. 2008. Retrieved April 10, 2008. ↑ "Brian Dennehy Biography". Yahoo! Movies. 2008. Retrieved April 10, 2008. ↑ Harmetz, Aljean (April 23, 1989). "FILM; For Brian Dennehy, Character Tells All". The New York Times. Retrieved June 24, 2010. 1 2 Ehrenberg, Nicholas (November 11, 2005). "Fake War Stories Exposed". CBS News. Retrieved 18 December 2014. 1 2 Burkett, B. G. (September 2, 1998). Stolen Valor : How the Vietnam Generation Was Robbed of Its Heroes and Its History (1st ed.). Verity Pr Inc. ISBN 096670360X. ↑ "Brian Dennehy '60 - cover story". ↑ "Exclusive: Brian Dennehy Lands "Meaty" Sitcom Role". TV Guide. 2008. Retrieved September 4, 2008. ↑ "Brian Dennehy's IMDB profile". Retrieved March 20, 2009. ↑ "IFTA nominations for Farrell & Gleeson". RTÉ. January 8, 2009. Retrieved January 8, 2009. ↑ Ahearn, Victoria (March 12, 2009). "Brian Dennehy narrates film on Toronto's role in Irish famine". The Star. Retrieved March 20, 2009. 1 2 "The Bull in winter". The Irish Times. January 1, 2011. ↑ "Theater Hall of Fame Ceremony, Honoring Linda Lavin, Brian Dennehy, Michael Blakemore, Presented Jan. 24". Playbill. ↑ Fintan O'Toole (January 1, 2011). "Real-life dramas? We don't do those. But John B Keane did". The Irish Times. ↑ Emer O'Kelly (January 23, 2011). "The ignoble passions of The Field fail to ignite". Independent.ie. ↑ Bullen, Robert (May 8, 2012). "Goodman's Iceman Cometh, Starring Nathan Lane, Chills to the Core". Huffington Post. ↑ Isherwood, Charles (February 12, 2015). "Review: 'The Iceman Cometh' Revived, With Nathan Lane and Brian Dennehy". New York Times. ↑ Brucie, Dylan (March 2007). "Ultimate Spider-Man". Wizard Xtra!. p. 117.